Some might argue that the real point of going to a football game is to sit back and have a few cold ones. Sure, the game is fun and exciting, but having some drinks out of the back of your car in a parking lot is just some of the most chill times that you can have during the fall and winter. And, don’t even get us started about grilling out and eating until it’s hard to walk! David’s Soundview Catering’s New Event Space + Cafe Has Landed at The Landing! If there’s one thing that we can say about Chef David Cingari it’s that he’s one of the kindest, most fun people you’ll ever meet. But, don’t be fooled by his booming laugh and kind heart, he’s one badass when it comes to cooking and running his super popular catering company, David’s Soundview Catering. And, while he’s been making marks on the culinary scene with his company since 1998, he’s never done looking for the next best thing. Last year he opened Cafe 1000 in Bridgeport which made its mission to feed locals and workers for breakfast and lunch. And now, David has made things even more amazing with two new additions. 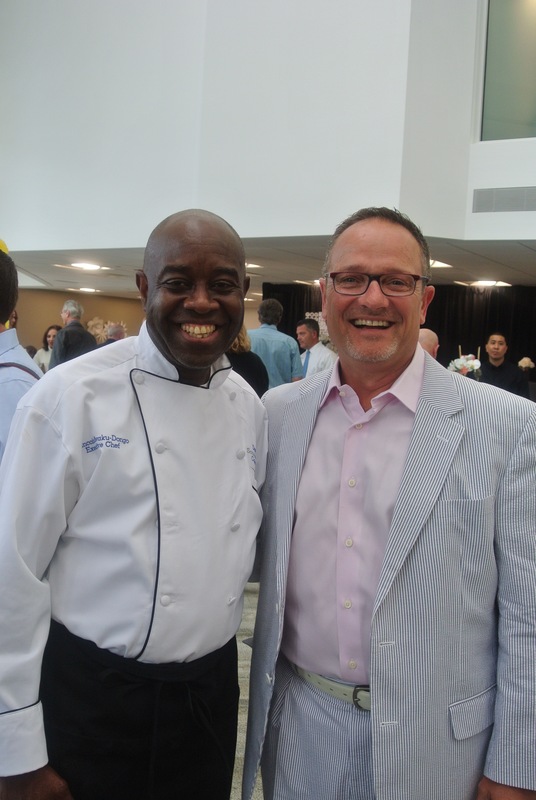 The first addition is David hired the ever-smiling Francois Kwaku-Dongo, his new Executive Chef. Readers of our blog should know that name because he was the opening chef at JHouse in Greenwich, as well as the Executive Chef at l’escale. Yep, he’s got some major cred (and skills), so much so that we can’t even list them all here. Summertime’s here . . . and we hope you’re ready. Nah, we’re not talking about your beach card or sun tan lotion, we’re talking about knowing how to grill more than just hot dogs and a simple burger on the barbie. Yeah, we’re talking about going all out with some wicked good food. And, with the following three recipes from Marcia Selden Catering, the badass griller in you will be awakened, releasing a torrent of pure savory awesomeness upon your guests. So, let’s do this and check out the recipes for The Ultimate Badass Burger, Coffee Rubbed Ribeye, and Grilled Romaine Wedge Salad with Chimichurri Vinaigrette. This burger uses soy sauce and sun-dried tomato to give it that killer umami flavor to kick it up to super bad-assness! Farms are what keep us rooted to our humble beginnings, they keep us in touch with nature…farms are what keep us alive. And, while most people probably only have surface level interactions with farms by purchasing their foods at stores or getting a bit closer to the source by visiting farmers’ markets, farms have lots going on behind the scenes. The sowing, the planting, the watering, the manicuring, and the picking. And, there are plant-y of other things going on at farms, depending on the season. So, this is where we leave you: some great events, workshops, and dinners at farms in September and October for you to dig.